Who’s ready to rock around the Christmas tree with us here at The Fox? The Fox is the perfect place for a festive shindig, if you need a hand organising your Christmas Party? Why not let us host – we’re the perfect place for any party, whether it’s with friends, family or an office party – let us do the cooking. We’ve got a festive lunch & dinner menus running all throughout December and there all Mr & Mrs Claus approved! Grab a seat and let the party begin. Christmas Day is looking busy already but we’ve still got space for a few more elves. We can’t wait to celebrate with you all. Spread Christmas cheer by joining us for a day full of celebrations, family and festive fun! Join us for a 3-course delight and seen as it is the season to sparkle, up the ante by adding one of our drink packages, the perfect addition to any Christmas day celebration. Have yourself a Foxy little christmas by booking your table now! Let us do the washing up! Calling all families! We’re home to our very own Santa’s grotto this year! Join us on Wednesday the 6th for Letters & Lunch with Mr Claus. Join us for a day full of festive fun, letter writing, a festive themed lunch and get to meet Santa himself, with a little added gift for all children! Make sure you’re put on the nice list and don’t miss out by booking now, it’s the perfect day for everybody. You’ll even get to meet Santa’s Little Foxes too! 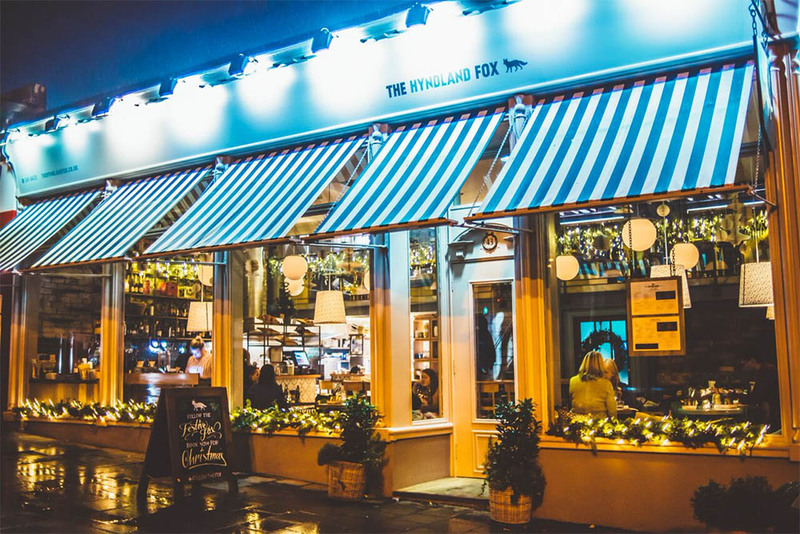 The Fox is the place for celebrations this festive season, we’ve got all your entertainment needs covered, from acoustic Sundays to bringing in the bells, we’re jingling all the way! Sunday’s in The Fox are home to an festive acoustic set by Scarlett Randle, our Fox regular will be singing some classic festive tunes, helping you relax after those days of last minute Christmas shopping! Find Scarlett on the 10th & 17th from 3pm. Black Friday (22nd) is the night for all that Jazz, we’ve got Old Bohemia joining us for an evening to remember. Christmas Eve is home to our Kim Wheeler, who will be singing in those celebrations before you all head to bed and wait for Santa to arrive! Keep your eyes and ears peeled on our social media platforms for all the information on these events – we can’t wait for December, we hope to see you having a dance with a glass of fizz! The Foxes 12 Days of Christmas is coming back with lots of sparkle this year. Throughout the first 12 days of December expect wee festive wows every day for you all. Make sure you have liked our social media in preparation, you don’t want to miss out! Free mince pies anyone? With closing the Christmas months with a bang. Hogmanay is home to Beards & Bards, a Scottish ceilidh duo who will be bringing in the bells for us all. The celebrations don’t stop with that, join us for a handcrafted Hogmanay menu, enjoy a glass of fizz on arrival and a dram at the bells! Get your table booked for the evening and then join us for a evening of dancing until 1am. Let us organise the welcoming of 2018 – pop in for a chat or have a look on our website. We’re all so excited here for the Christmas celebrations! We can’t wait to see you all.